Whether you and your family are climbing to the top of Machu Pichu, visiting the castles of Europe, or heading for the sandy beaches of the Caribbean, chances are you are going to find yourself in an area with questionable drinking water. Locals living in a given area have spent a lifetime building up a resistance to water borne pathogens. The same cannot be said for you and your family. And, there is nothing that ruins a family vacation quite like drinking dirty water and spending your vacation on the toilet, or in the hospital. 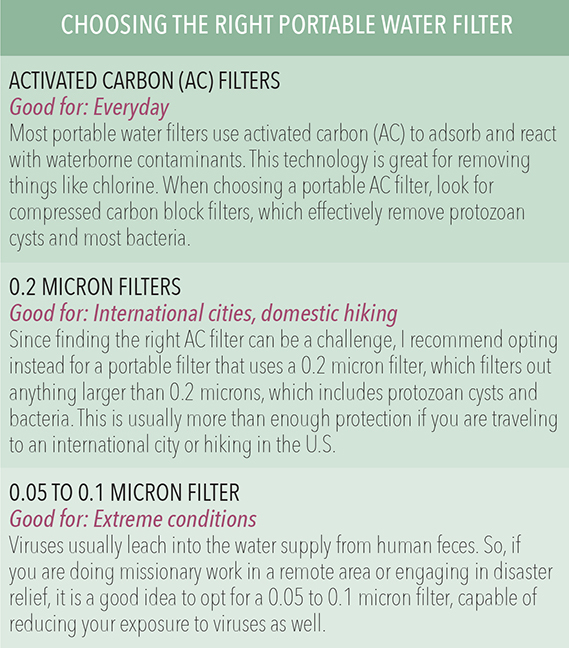 Fortunately, there are several state-of-the-art, portable water filters that can easily fit into your luggage. 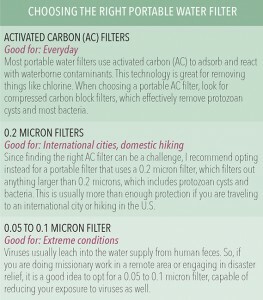 The key is to get a filter rated for the area of the world to which you are traveling. Each filter is rated for its ability to remove one or more of the following: (1) parasites, also known as protozoan cysts (e.g. cryptosporidia, giardia, and amoebic dysentery); (2) bacteria; and (3) viruses. 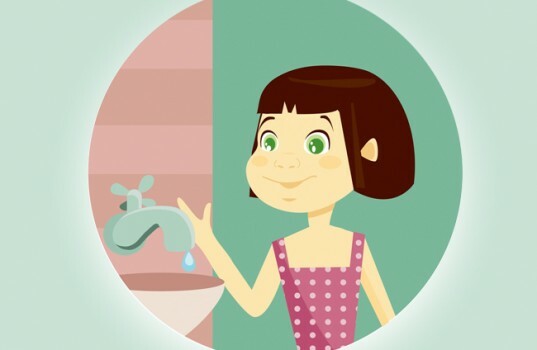 In addition to acute bugs, many countries’ water supplies contain high levels of chloramines, pesticides, volatile organic compounds, and even pharmaceutical drug residues. Your short-term exposure to these will not increase your risk of cancer or anything else for that matter. With that said, if you are pregnant, you will want to take extra precautions since many water additives such as chloramines (THMs) are potent gestational toxins. While bottled water may be provided by your hotel or town market, it is important to understand that bottled water can be (and often is) contaminated with microorganisms. If you are going to a place where bottled water will be available, then you may want to pick up a SteriPEN®. A SteriPEN looks like a giant marker. It has a UV lamp sticking out the end and is battery operated. Simply turn it on and dip it into your bottled water and it kills all microorganisms (including viruses) within 60 seconds. While traveling, bring along a bottle of activated charcoal, a bottle of nascent iodine, and a bottle of nano-silver. All three are safe for adults, pregnant mothers, and children, and are available at most health food stores. Both the nascent iodine and the nano-silver are anti-parasitic and therefore provide protection against parasitic malaria. At the first sign of stomach upset, take four (4) capsules of activated charcoal and drink 8 ounces of water with 5 drops of nascent iodine and 1 tablespoon of nano-silver. You can repeat this every four (4) hours for 24 hours. This should arrest the onset of a water borne infection. Of course, if the condition worsens, seek medical attention right away. If you or your family come down with a case of dysentery, it is important to rehydrate with electrolyte-rich water. While gatorade may work in a pinch, I prefer marine plasma. Trusted by doctors throughout Europe for over 110 years, marine plasma has been shown to effectively treat dehydration due to diarrhea. The Quintessential-brand marine plasma is available through LongevityWarehouse.com.